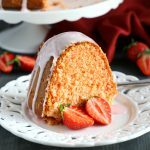 This Best Ever Strawberry Pudding Cake is the perfect summer cake recipe - it's ultra moist and tender with a sweet strawberry glaze! Let the cake cool completely on a cooling rack before adding the glaze. Prepare the glaze by sifting the powdered sugar into a bowl and adding the strawberry syrup about one teaspoon at a time until a thick glaze forms. The ideal glaze is thick, and just barely pourable. Pour the glaze over the top of the cake and let it drip down the sides slowly. Cut the cake into slices and serve with fresh strawberries, if desired.